Spring Semester Workdays begin Tuesday, February 19, 2019! Workdays will pause for Yale’s Spring Break between March 9th and March 24th. After March 24th, Tuesday and Sunday Workdays will end at 5:00pm. In May 2003, the first group of YSFP student interns began to transform a forgotten corner of Farnam Memorial Gardens into an agricultural space. Today, the Yale Farm at 345 Edwards Street (a 15-minute walk from Old Campus) is a lush and productive academic farm that produces dozens of varieties of vegetables, fruits, herbs, and flowers, and is home to free-range laying hens and honeybees. 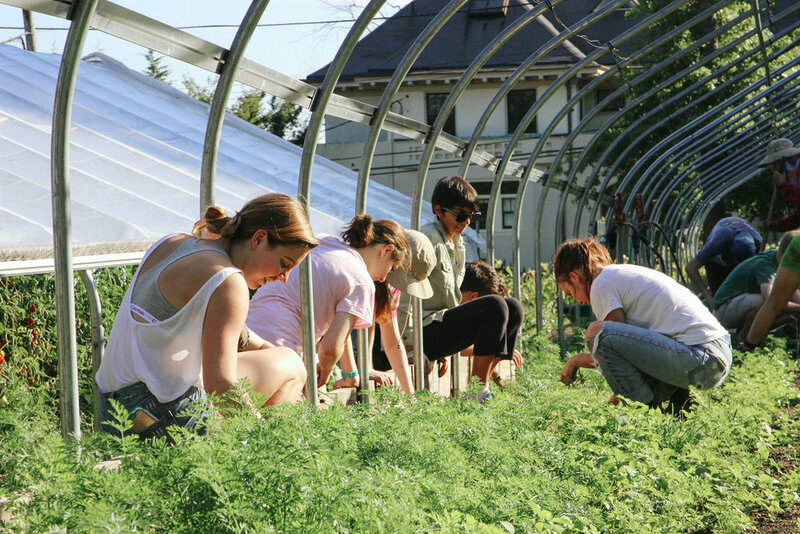 Twelve months a year, students, faculty, staff, and members of the New Haven community visit the Yale Farm to study the connection between land and food. The Farm employs growing practices and crop rotations that reflect our regional and national agricultural landscape. In this way, the Yale Farm strives to be a working model of agricultural approaches that students can participate in directly. During the academic year, Yale professors from several departments – from Anthropology to American Studies, Mechanical Engineering to Women’s, Gender, and Sexuality Studies – use the Yale Farm as a resource in their coursework, as they would a museum or an art gallery. The Farm also hosts weekly volunteer workdays run by an excellent staff of student interns. In the spring and fall, we end Friday workdays with pizza from our hearth oven. The Farm’s “Seed to Salad” Program (designed and directed by graduate students at Yale’s School of Forestry & Environmental Studies) brings classes from New Haven Public Schools to the farm on a weekly basis for lessons in ecology, science, and food production. Each summer, six undergraduate interns manage the Yale Farm as part of the Lazarus Summer Internship. The Internship includes on-site training, field trips to regional growers, farmers’ market experience, and lessons in the ecological, economic, and social issues that orbit food and agriculture. The Yale Farm is a social hub on campus. Prospective students are invited to work on the Yale Farm during Bulldog Days every spring. In late August, new students gather around the oven to share pizza before leaving on their Harvest pre-orientation trips. Yalies make lifetime friends on the Yale Farm. Harvesting occurs on a weekly basis year round. Students sell the majority of this produce at our local CitySeed Wooster Square Farmers’ Market. Farm produce is also cooked on-site for YSFP events and speaker series.